With another weekend of wrestling ahead of us, British wrestling just continues to move forward. This week we're looking at a couple of Southside Wrestling Entertainment shows, one on Friday in St Neots, Cambridgeshire and another on Saturday in Nottingham, as well as a Source Wrestling School event in Glasgow, also on Saturday. Of course, we also have alternative shows from around the country that this week features shows in Glasgow, Liverpool, so there's certainly a bit of something for everyone as we get Ready for the Weekend! Friday night kicks off the wrestling weekend with Southside Wrestling Entertainment hosting the first of five weekend events! 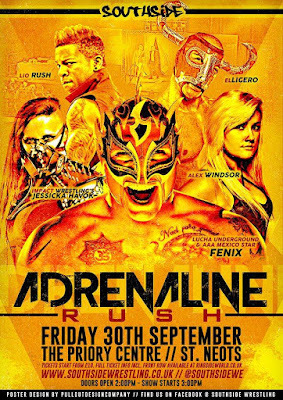 This first event entitled Adrenaline Rush shall be held at The Priory Centre in St Neots. As is the norm with SWE, the card is packed with international stars alongside home-grown stars of the UK. One match that is the essence of international and domestic is Bubblegum vs Fenix. Bubblegum is one of the finest wrestlers in the UK. Simple as that. Numerous wrestlers name him as an example they wish to follow and learn from while others claim that the best matches they have had in their careers have been with him. He is constantly in the upper echelon of talent in the UK and has held numerous championships in British Wrestling, some on multiple occasions. His opponent, Fenix, is best known on these shores for his time in Lucha Underground where he is one third of the current Trios Champions. Fenix is an exceptionally fast competitor who utilises his Luchador style to perfection. Both of these men will be competing in the Speed King tournament the following day and may meet at some point. This match will give both men an idea of what they'll face should that happen and whoever wins this match, may well take a psychological advantage on any future contests. The war between Joseph Conners and El Ligero continues to grow ahead of their championship match on October 29th. Neither man is allowed to touch the other unless it is a competitive match. That being said, both men will meet in a tag team match this Friday. Now another scheduled match this weekend will see the duo of Ligero and Brian Cage face Conners and HC Dyer. Conners wasn't best please at Ligero's choice of partner and when this made it's way to “The Mexican Sensation”, he hit back claiming that he could beat Conners with anyone as his partner. Conners is one of the sharpest minds in wrestling and capitalised on that by challenging El Ligero to let him choose the partner. It was accepted and now Conners has an ace in the hole. We don't know who he will choose but it doesn't take a genius to know that it is unlikely to be someone that will be of aid to Ligero and most certainly will be an aid to Conners. Originally SWE had announced that Sami Callihan would be facing Will Ospreay. However due to Ospreay being unable to compete this Friday, this has created an opportunity. That opportunity will be heading to “Smashmouth” Chris Ridgeway who will be filling the void. Now Ridgeway is certainly not here to make up the numbers and he will know that this is a huge opportunity to not only test himself against a world-class calibre wrestler but also to send a message to everyone else. 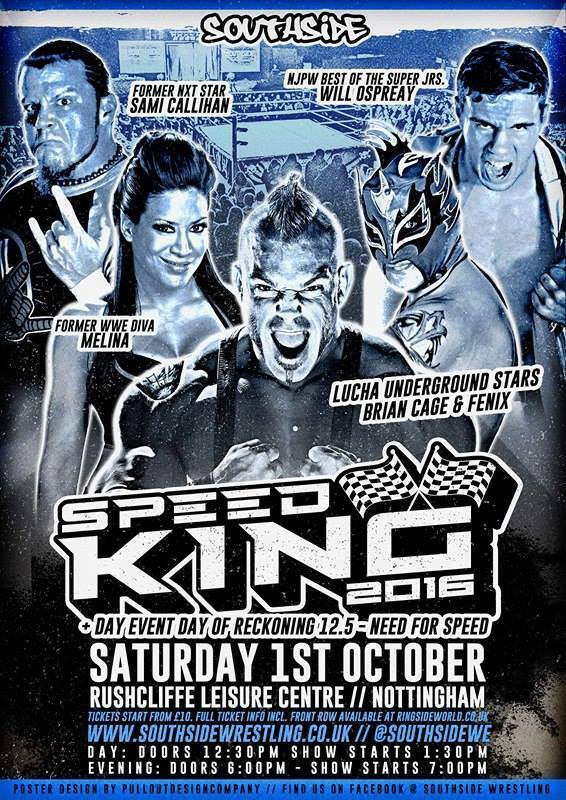 Ridgeway is part of the Speed King tournament this weekend and a win over someone like Callihan would do amazing things for his confidence and mindset. That being said, if Callihan does walk away with the win, it could motivate Ridgeway even more. “Smashmouth” hits hard to begin with, as does his opponent. When Ridgeway has confidence or anger in his mind, he's even more hard hitting. 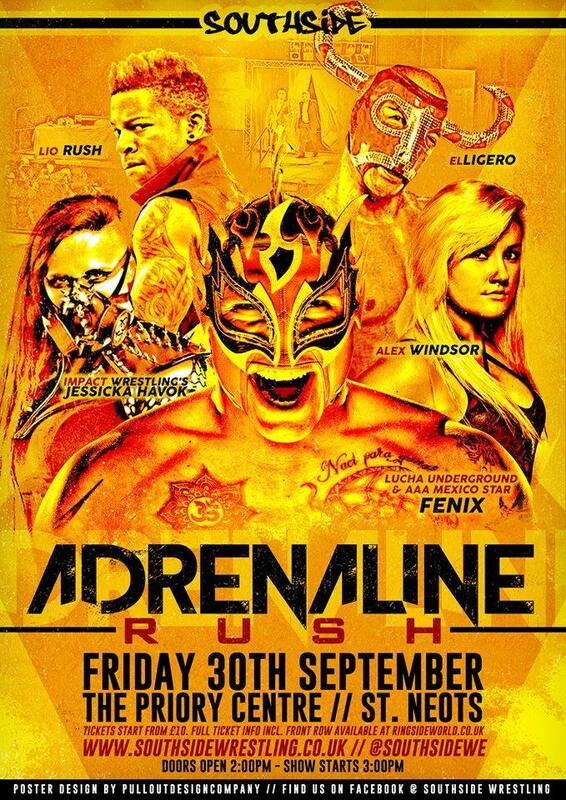 This Friday will also see Damian Dunne taking on international star Lio Rush while Jessicka Havok is back in SWE where she'll compete against Alex Windsor. In a true international match, New Zealand's Travis Banks and Japan's Kazma Sakamoto will face each other in singles action. And finally, Southside Wrestling always like to have some multiple competitor matches on their shows and Friday will be no different as Chris Tyler, Robbie X, Chris Brookes and Nixon Newell all fight it out in a fatal four-way match in St Neots. Saturday shall see Source Wrestling School's second event in Bridgeton, Glasgow at the Bridgeton Community Centre. The first event they held their was a huge success with a loud crowd packed in the building. This Saturday's event look to be a repeat of that based on the matches that have been a announced so far. This weekend has a special extra layer as the president of All Japan Pro Wrestling, Atsushi Aoki shall be competing in Bridgeton as well as Source Wrestling School's other event in Govan on the Sunday. On the Saturday, Aoki will be facing one of the top heavyweight wrestlers in Europe in the shape of “Iron Man” Joe Coffey. Aoki will bring his experience of competing for over a decade in a true test for Coffey. While obviously a test, Coffey shall have an idea what to expect this Saturday as he has spent time in Japan himself and faced a number of competitors during that time. Aoki has not been in the UK for over 5 years and there is no indication of when or if he ever will return again. Matches like this are few and far between which makes them even more unmissable to wrestling fans. Tag team wrestling or more precisely tag teams are on fire right now in the UK. One of the top regarded teams in the UK if not Europe are the duo of Jackie Polo and Mark Coffey, better known as Polo Promotions. Now both of these men had success as singles competitors before joining together, but their success as a team has been even greater. Their opponents this Saturday in Bridgeton have had a similar beginning. Lewis Girvan and Aspen Faith are two of the finest young wrestlers in Scotland today. In fact scrap that, they're two of the finest young wrestling in Britain today! While they are known, the feel they aren't taken as seriously as they should be and have decided to join forces and form The Kings Of Catch. Now all four of these men are proven in the ring. They're all great individually. They're just as good as teams. Put both of those teams together in one match and we could have a match we're talking about for a long time after this weekend. Polo Promotions have proven themselves as one of the best team today. They've got the accolades to back it up. The K.o.C. may be new to the tag team circuit but Polo Promotions will know the quality that faces them. They'll probably see parts of themselves when they first began as a team in this new duo of Girvan and Faith. If Polo Promotions win, they'll prove again why they have their reputation. If The K.o.C. pick up the victory, they'll make a statement right out the gate that they're here to make people pay attention. Source are not only producing some of the best new wrestlers in Scotland right now but they're also showcasing some of the most promising talent in the UK. The match between Ryan Griffin and Danny Jones is a prime example of that. Griffin is a Source graduate who now holds the SWA Junior Heavyweight Championship with a reign of over 500 days. He's continued to improve and evolve his craft since his debut a few years ago. His opponent, Jones hails from South Wales and is a graduate of the Dragon Pro Wrestling Academy. He's been competing for a number of years under a number of guises but now he stands simple as himself. Jones is a quick moving, very entertaining wrestler to watch, much like Griffin. These two men have never met in a match yet they do share a number of similar traits. This match encapsulates one of the Source Wrestling School's greatest positives. It's bringing two young, hungry, talented wrestlers together to let us the fans see what the near future holds for British Wrestling. 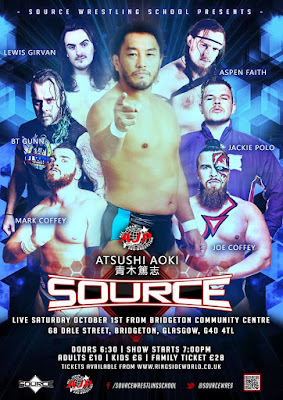 Also scheduled so far for Source's event at the Bridgeton Community Centre in Glasgow is a match between two wrestlers from other training schools in Scotland. Glasgow Pro Wrestling Asylum's C.S Rose shall be taking on Premier British Wrestling Academy's Aaron Echo in a match that will mark both men's debut for the Source Wrestling School. 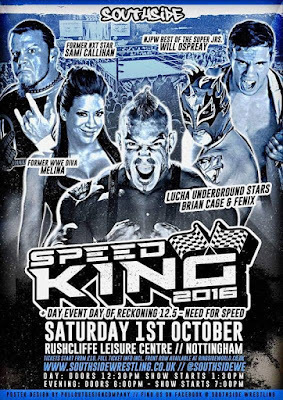 As their big weekend continues, SWE present two event on Saturday in Nottingham, with Day of Reckoning 12.5 in the afternoon, whilst the show we're focusing on Speed King 2016 is in the evening. This is the fifth incarnation of the junior heavyweight tournament that boasts Marty Scurll, Martin Kirby, Jay Lethal and El Ligero as it's previous winners. The tournament takes the form of six singles matches, leading into a six way scramble to crown the winner. In a break from the norm, I'm going to be assessing the chances of six of the top contenders to the crown! Perhaps the favourite to take the crown is Will Ospreay, who has had the biggest year of his career, so far, after breaking into New Japan Pro Wrestling in April and winning Best of the Super Juniors XXIII. He's also reached the final of PWG's Battle of Los Angeles, HOPE's King of Flight and TNA's Joker's Wild, whilst also winning the RevPro British Cruiserweight Championship this year. The reigning Speed King Champion is undefeated in SWE since winning the belt from Andrew Everrett in August. Ospreay kicks off the day with a huge match against Brian Cage, before having a mouth watering clash with Lio Rush in the First Round! With The Aerial Assassins' appearances in the UK becoming sparser over the last few months, this is a rare opportunity to see a performer who has been on the tip of the wrestling world's tongues in 2016. Fenix will be making his SWE debut across the weekend, having wowed audiences on Lucha Underground, as well as reaching the Semi-Finals of Battle of Los Angeles this year. The Mexican star has already won the Lucha Underground Trios Title and PDM Light Heavyweight Championship (twice) in 2016 and is looking to make Speed King the centre piece of his debut weekend. He'll have his work cut out for him as he face Stixx on the afternoon show, before rolling on to face Sami Callihan for the second time in just over a month! Another performer who isn't often seen in Europe, let alone the UK, he'll be bringing a style that Nottingham may not be used, but will certainly have them loving the lucha thing on Saturday night! It's a big weekend for Martin Kirby, who celebrates his 100th SWE appearance on Sunday, but before that he'll be a major part of Speed King, as he goes up against Robbie X in the First round. Kirby already has a Speed King victory to his name as he defeated the likes of Kay Lee Ray, Ospreay and Pete Dunne to win the tournament in 2014. He's also had a run with SWE Tag Team titles in 2015, whilst winning the HOPE Championship and PCW Tag Team Championship this year and having more tournament success in GBP's Junior Heavyweight Cup in 2015, DPW's Tag Team Title Tournament in 2010-11 and 3CW's Free for All Rumble in 2008. Kirby's familiarity with SWE would have to elevate him to one of the tournament favourites, and his ability to entertain the crowd whilst wrestling a high impact style will make sure that his involvement will must-watch, no matter what. The dark horses for the tournament, includes Lio Rush, Mark Haskins and Sami Callihan. In just his third year in the business, Rush has had an incredible 2016, winning ROH's Top Prospect Tournament and MCW's Shane Shamrock Memorial Cup XVI, as well as winning CZW's Wired Championshion on two seperate occassions. Rush also making fan's sit-up and take notice with a breakout match with Jay Lethal at ROH Supercard of Honor X - Night 1, so he'll be looking to captilise on his momentous year, by taking the Speed King title back to Lanham, Maryland. Haskins has been collecting championship gold this year, winning the PROGRESS World Championship, Smash Wrestling Championship, 4FW Junior Heavyweight title and FNW British Championship all within one calendar year. However, he hasn't won a tournament since 2009, and despite tearing it up at the Battle of Los Angeles and all over Europe, Haskins will be looking to show that he can get it done against some of the World's best Junior Heavyweights, when he tackles Stevie Xavier in the First Round. Callihan has been a man on a mission since leaving WWE at the end of 2015, having great matches in PWG and EVOLVE, winning titles in AAW, PWX, FCP and PW 2.0 and getting to the semi-finals of wXw's 16 Carat Gold Tournament. He's arguably the most powerful wrestler in the tournament and will be looking to use that too his advantage, whilst also showing he's got plenty of speed to matches his opponents. Matt Cross, Bubblegum, Stevie Xavier, Robbie X, Chris Ridgeway and Chris Tyler complete the field for the tournament, but they certainly won't be there to just make up the numbers! They'll be chances for them to prove that as Cross will go up against Tyler and Bubblegum will tangle with Ridgeway with a win putting them straight into the final! Also on the card, El Ligero teams with Brian Cage to take on Joseph Conners and HC Dyer, whilst Nixon Newell will team with 3 time WWE Women's Champion Melina to face Kay Lee Ray and Alex Windsor.